On October 28, 2012, at the American Swedish Institute (“ASI”) campus, the ASI and the Jewish Community Relations Council of Minnesota and the Dakotas (“JCRC”) commemorated the 100th anniversary of the birth of Raoul Wallenberg. Mr. Wallenberg, in conjunction with diplomats from other neutral countries, saved about 25,000 Budapest Jews from extermination between July, 1944 and January 17, 1945, when he was detained by the Soviets. Mr. Wallenberg is presumed to have died in Soviet hands. Mr. Wallenberg is an iconic figure to Jews and Swedes alike and all of humanity. The JCRC thanks ASI President and CEO, Bruce Karstadt, the ASI staff, board and supporters for their generosity of spirit and resources in conjunction with the joint programming celebrating the story and legacy of Mr. Wallenberg – who became the second person (after Winston Churchill) awarded honorary American citizenship, in 1981. Participating in the commemoration – which filled the Nelson Cultural Center capacity of 350 – was Swedish public official, Ingemar Eliasson and Holocaust survivors: Fred Baron, Dr. Robert Fisch and Charles Fodor. Cellist Janet Horvath and pianist Heather MacLaughlin provided music. St. Cloud State University professor Daniel Wildeson moderated the panel discussion. 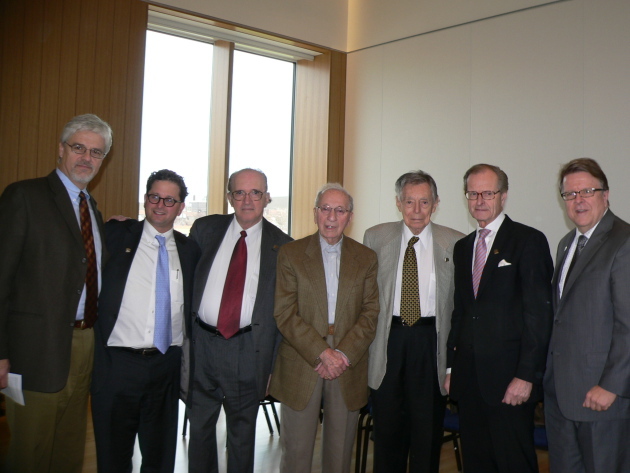 Pictured (l to r): Dr. Daniel Wildeson, Steve Hunegs, Charles Fodor, Fred Baron, Dr. Robert Fisch, Ingemar Eliasson, and Bruce Karstadt. The program “Unfinished Business: Recognizing Raoul Wallenberg” began with the distribution of a poignant lapel pin representing Mr. Wallenberg. The pin is a replica of Mr. Wallenberg's briefcase left behind after his disappearance in 1945. Etched on the pin are the initials “RW.” Bronze cast sculptures can be found in memorials near the United Nations building in New York City and outside the Ministry of Foreign Affairs in Stockholm commemorating Mr. Wallenberg's unfinished work. The program's keynote speaker, Mr. Eliasson, had a distinguished career in Swedish government: parliamentary leader, Governor of Varmland, Marshall of the Realm and chair of the Commission of Inquiry that investigated Sweden and its response (or lack thereof) to Mr. Wallenberg's disappearance. Mr. Eliasson provided insights into the life and Budapest mission of Mr. Wallenberg as well as both the Swedish Foreign Ministry's response to Mr. Wallenberg's disappearance and the meaning of his legacy 67 years after the end of the Second World War. Mr. Eliasson noted that Mr. Wallenberg performed his mission of mercy during the “darkest chapter of human experience” and while for Jews in Budapest “life was at the bottom of hell.” Mr. Wallenberg came from one of the leading families of Sweden and his name was suggested as an emissary for the mission due to a chance meeting: a Wallenberg family business office was located in the same building as offices for American consular officials in Stockholm. Looking for a Swede – in 1944 – to assist the Jews of Budapest, an American riding the elevator with a person from the Wallenberg firm asked for a suggestion. Raoul Wallenberg was suggested. The suggestion proved prescient. According to Mr. Eliasson, Mr. Wallenberg had many of the qualities required to act audaciously in the presence of Adolf Eichmann and his determination to murder the last large population of Jews surviving in Nazi-occupied Europe. Seemingly a cross between an OSS agent and a Boy Scout, Wallenberg was handsome and preternaturally calm, possessing a healthy sense of humor and a keen capacity for organization and quick-wittedness. He was also brazen and brave. Speaking English (he had studied architecture at the University of Michigan in the 1930s) and German – and some Russian – Wallenberg arrived in Budapest in June, 1944 on a joint mission of the Swedish government and the War Refugee Board of the United States government. Germany was destined to lose the war but determined to complete the "Final Solution" even as the Red Army was advancing towards Hungary and the western Allies were fighting in Normandy and ultimately breaking out of their bridgehead for the advance on Germany. Mr. Wallenberg faced numerous obstacles on the ground in Budapest. 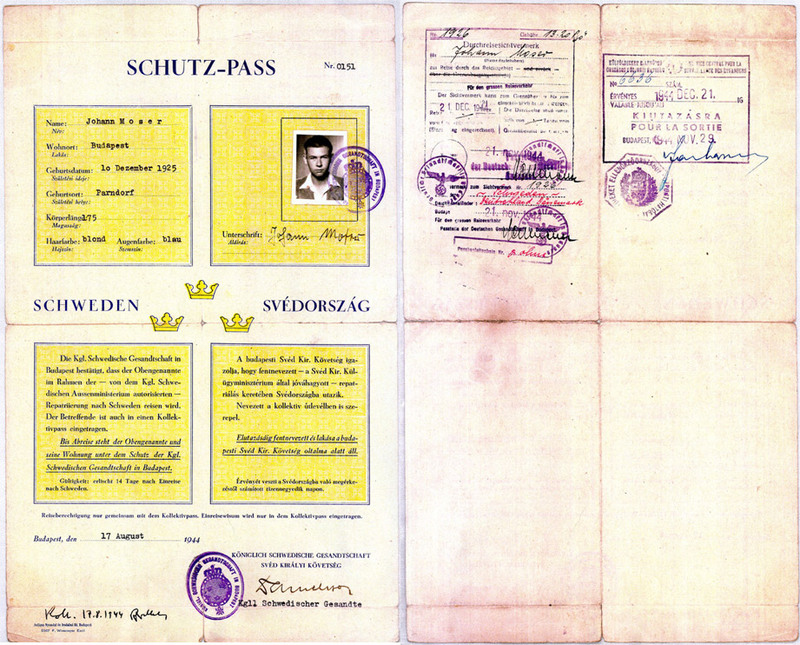 The Jews of greater Hungary had already been deported and exterminated at Auschwitz and Wallenberg and his operation – which eventually numbered 400 people – worked assiduously to create the Schutz-Pass ("protective passports" which identified the bearers as Swedish subjects awaiting repatriation and thus prevented their deportation and safe house to protect the Jews of Budapest). Wallenberg's courage and industriousness was displayed both in the streets and buildings of Budapest as well as its rail yards. Wallenberg would get word of trains leaving with Jews for deportation and he would halt the train under the machine pistols of SS officers and demand the release of Jews under Swedish protection. Wallenberg's mission became more complicated when the Germans removed the Hungarian leader Admiral Horthy in October, 1944 and the Hungarian Fascist “Arrow Cross” became the de facto government of Hungary. Wallenberg faced the challenge of procuring food and medicine for tens of thousands of people while the Arrow Cross was determined to starve and murder the Jews of Budapest. The Red Army liberated Budapest on January 17, 1945. The surviving 120,000 Jews of Budapest survived due to the efforts of Wallenberg and other emissaries of neutral countries (including Spain, Portugal and Switzerland) inspired by the leadership of Wallenberg. Following Mr. Eliasson's remarks, the gathering was treated to music from Janet Horvath – retired principal cellist of the Minnesota Orchestra – and the daughter of a mother saved by Raoul Wallenberg, and Heather MacLaughlin – one of the leading chamber music pianists in the Twin Cities – accompanied her on piano. They beautifully played a combination of Jewish, Hungarian and Swedish music. Robert Fisch, M.D., was born on June 12, 1925, in Budapest, Hungary. As a young man he dreamed of being an artist or an architect, but when the war ended he enrolled in medical school. Dr. Fisch survived not only the Holocaust, but also the dark days of Communism in Hungary. After the Hungarian Revolution he left for Austria and with the help of HIAS, immigrated to the U.S. in 1958. For Dr. Fisch, the Holocaust is a horrible memory. Dr. Robert Fisch is an artist, noted author and world renowned for his work in pediatrics. Charles Fodor was born on July 14, 1936, in Budapest, Hungary. Charles Fodor was eight years old in 1944 when he and his grandmother were trying to find their way to an international safe house. As they ran along the promenade close to the Danube River, three women wearing the armband of the Arrow Cross ordered them into an apartment building. Suddenly, a man grabbed his grandmother and took her and Charles out to the street. He told them, “You don’t belong here, get lost.” It was later they learned that all those in that building were taken out and murdered on the banks of the Danube River. “I have learned that life is most precious. Do a mitzvah each day to thank God for the gift of life,” says Fodor. Fred Baron was born on February 24, 1923, in Vienna, Austria. Fred was imprisoned in Auschwitz, where a fellow Austrian, non-Jewish kapo warned Fred and his fellow inmates, “You have arrived at hell on earth… don’t trust anyone. Don’t trust your best friend. Look out for yourself. Be selfish to the point of obscenity. Try to stay alive from one minute to the other one. Don’t let down for one second.” Fred was in numerous forced labor camps and was finally transported to Bergen Belsen. By the time the British arrived, Fred was near death. A British medic carried Fred to a field hospital where he was treated and finally transported to an emergency hospital in Sweden. Moderating the panel discussion was Dr. Daniel Wildeson of St. Cloud State University who is the faculty director of SCSU's Center for Holocaust and Genocide Education. Striking about the panelists was their sense of humor, candor and their greatest hope that no one should suffer as they did and their anguish over the continuation of genocide into the 21st century. Dr. Fisch spoke of humanity – the need to retain humanity even under inhumane circumstances and the necessity of teaching humanity to children by providing appropriate role models through caring parents. Fred Baron observed that (despite the killing of innocents) 67 years after the Shoah he remains optimistic that learning the lessons of the Holocaust to prevent such horrors in the future is, although slow, inevitable. Charles Fodor noted the parents and grandparents victimized in Cambodia, Rwanda and Bosnia must teach their children their history. All three gentlemen have spent years telling their stories in schools and now at the ASI reminding their audiences of the good they also encountered and their aspirations for all of us in either the face of knowledge or of evil. Mr. Fodor told the story that in December, 1944 as the Arrow Cross was hunting down Jews in the streets of Budapest he and his grandmother were ordered to enter a certain apartment building. A man materialized seemingly from nowhere and led them away advising them to "get lost." All the people herded into the apartment building were murdered and their bodies tossed into the Danube. The anonymous person who saved Mr. Fodor is the power of the difference one person can make. Mr. Baron reminds us the power to prevent future genocides begins by judging people by their hearts and minds; not by the color of their skin or the clothes they are wearing – while each person honestly addresses their own prejudices. A person who made a critical difference for Mr. Baron was a British Army physician who nursed him back to health after he seemed unlikely to survive after his liberation from Bergen Belsen. Mr. Baron also remembers his family's non-Jewish neighbors who hid family members in Vienna after the Anschluss between Germany and Austria. Dr. Fisch believes in the strength of the individual to change the world as opposed to public officials and governments. He has written "Light from the Yellow Star: A Lesson of Love from the Holocaust" in which he describes his experience during the Holocaust through his paintings and prose. He also challenges the Jewish Community Relations Council of Minnesota and the Dakotas and the American Swedish Institute to honor the memory of Raoul Wallenberg through finding ways each year to educate the public – particularly students – about his life and legacy. The Wallenberg event was supported by The Beverly Foundation of Minnesota and The Otto Bremer Foundation of Minnesota. Learning from Freedom Rider, Ernest "Rip" Patton, Jr.
Steve Hunegs was named Executive Director of the Jewish Community Relations Council of Minnesota and the Dakotas (JCRC) in November of 2006. Hunegs has a long association with the JCRC. He served on the Board of Directors from 1993 to 2002 and served as Board President from 1998 to 2000. Read more about Steve Hunegs. Nostra Aetate was a landmark document in the Church's relationship with the Jewish people. One of the darkest moments in United States history for the executive and judicial branches was the promulgation of Executive Order 9066 on February 19, 1942, authorizing the military to "exclude" Japanese Americans from "military areas." In honor of Bastille Day and the tradition of the friendship between the United States and France, America's oldest ally, we pause to consider the future of democracy, the free expression of ideas, and civility in a world where these values are not always shared. Great community thanks to the Reverend Nazim B. Fakir for organizing the Interfaith Prayer Vigil for the martyred of Charleston, on June 24, 2015, at St. Peter's African Methodist Episcopal Church. The Museum of Russian Art in Minneapolis commemorated the 70th anniversary of the end of "The Great Patriotic War" and the triumph of the USSR (and the legacy state of the Russian Federation), the United States, and the Allies in the defeat of Nazi Germany.